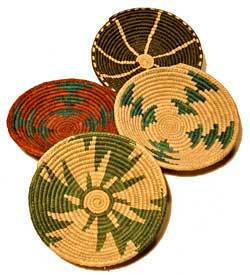 Southwest Style Extra Fine Baskets - 15"
Superb quality baskets in Southwest style designs. Most designs and colors are based on traditional Native American motifs. These are hand-made, the weave is tight and they have a very solid feel. Average diameter is 15 inches, but some may be a little larger or smaller. Patterns and colors may vary from those shown. If you have a preference, let us know in the "special instructions" box at checkout. We cannot select a specific pattern or color, but we can select baskets that are mostly light or dark in color or which are geometic or have animal designs (like dogs or butterflies). These are not a Native American made product. Imported. 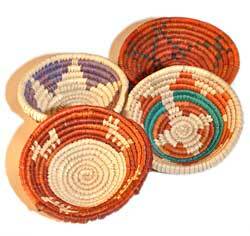 Southwest Style Extra Fine Baskets - 7"
Wonderful baskets in assorted Southwest style designs. 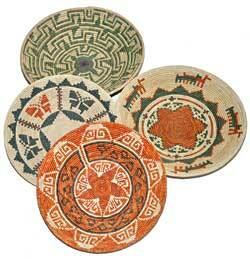 Most designs and colors are based on traditional Native American designs and the quality is superb. The weave is tight and they have a very solid feel. These average 7 inches in diameter and are available in assorted colors and patterns (our choice) and may vary from those shown. These are not a Native American made product. Imported. Wonderful little baskets that are finely woven from vegetal died fibers. These are great for gifts and can be used to hold small objects in your home like keys, coins, jewelry, and more. Sizes vary from about 4 to 5 inches in diameter. Available in assorted colors (our choice) and patterns may vary from those shown. Not a Native American made product. Imported.